AEGIS IMPACT is delivering the safest neck guard, using D3O Technology, to provide maximum protection without sacrificing performance to players. The AEGIS IMPACT Interceptor uses revolutionary D3O technology to provide impact and slack resistance with a lightweight, flexible feel. Development began with the singular goal of working with the global leader in cutting edge impact resistant and dissipation materials D3O® (http://www.d3o.com). D3O® has distinguished itself as the quintessential brand and materials provider and a pioneer of new and innovative concepts in impact protective equipment. Through impact testing and approvals, the bar has been raised and a new standard has been set for neck protection. Incorporating leading edge force absorption materials with lighter-weight, flexible materials, the AEGIS IMPACT Protection System is ready to change the sports equipment world. 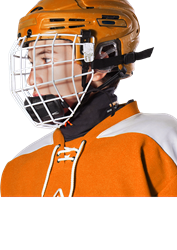 Hockey Players in Canada are required to be protected from slashes, however players were still being injured from puck and stick impacts to vulnerable areas around the neck. The logical step was to integrate an impact protective material into those existing design concepts and step up the level of protection. With the game of hockey becoming faster and shots becoming harder, the potential harm from impact can be catastrophic. After more than four years and a patent pending on the design, AEGIS IMPACT is excited to introduce the Interceptor to the ice hockey market. The Interceptor was met with great excitement at the ISPO show in Munich, Germany, and is highly anticipated for wide release. Please do not hesitate to contact AEGIS IMPACT to learn more, or request a quote online to experience the Interceptor for yourself.